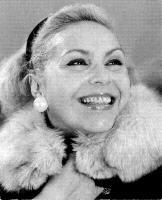 The soprano, Julia Wiener, was born in Sofia on the 17 June 1932. Her father was a professor of mathematics at the University of Sofia. During her years of study at the State Academy of Music between 1949 and 1952, she won first prize in the 1951 International Singing Competition in Sofia. Following her debut in 1951 singing the role of Leonore in Il Trovatore with the Sofia National Opera she became a leading singer with that company for more than 20 years. Since 1961, international guest appearances have taken her to the major opera stages of Berlin, France, Belgium, Holland, Switzerland, Russia, Czechoslovakia, Hungary and the United States. Major roles in her career included Leonora in Trovatore, Aida, Desdemona, Elizabeta, Lisa and Elisabeth in Tannhäuser. Known as a specialist in the lyric-dramatic characters of the Italian, French and Slavic repertoire, later in her career she added many of the German roles in the operas of Richard Wagner. Tchaikovsky: Pique Dame "Aria of Lisa, Act 3"